Scott is the second bearded dragon to be found in the area of Saumarez Lane, near Saumarez Park as we had Debbie found not far from the area earlier this year. The adult bearded dragon would have unlikely survived if it hadn’t been found as they originate from Australia and need a warm climate to live. If you know of someone who has lost their bearded dragon please ask them to call the GSPCA on 01481 257261. This afternoon a cat was rescued in a garden that had collapsed. 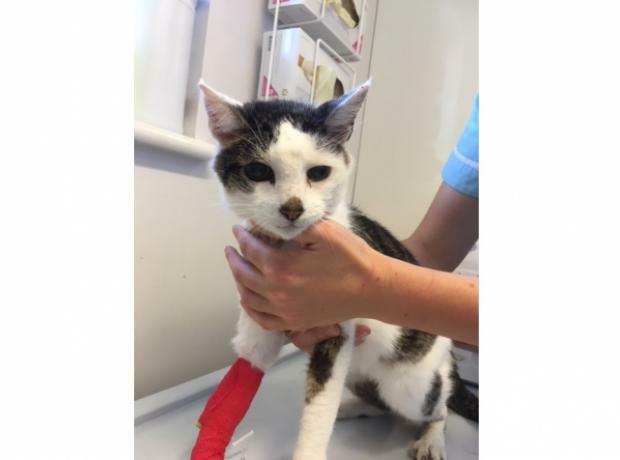 The female stray tabby and white cat is extremely thin and is extremely dehydrated so was rushed to the vets where she is currently on a drip. She sadly has no microchip and blood results are showing she has some major health issues. The cat was found in Castel and will need to stay with our vets as she is so poorly. We are appealing to anyone that has lost their tabby and white cat to please call the Shelter on 257261 or to pop in to the GSPCA in St Andrews. Last night a member of public while out found a very friendly black and white rex rabbit near La Hougette School. Now in the care of the GSPCA, we are appealing to anyone that has lost their rabbit to please call the Shelter on 257261 or to pop in to the GSPCA in St Andrews. Last night just after 8pm GSPCA Ambulance Night Wardens were called out to the seafront in St Peter Port to collect the fourth stray reptile in a week. 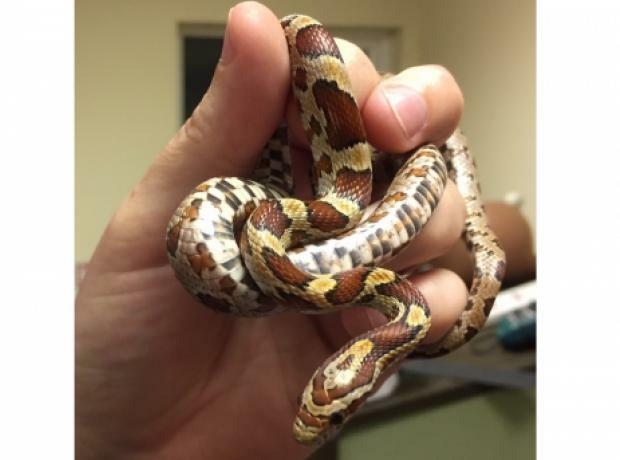 Two stray tortoise have been claimed, the bearded dragon is still at the Shelter and we are appealing for an owner to come forward and the reptile rescued last night is a Ghost Corn Snake. GSPCA Ambulance Night Wardens Matt Hill-Smith and Jen Bradshaw arrived at a restaurant on South Esplanade and found a very sweet, pretty, young Ghost Corn Snake. This evening a member of public while out for a walk along the Nature Trail near Cobo came across a wild animal more likely to be seen living in the desserts of Australia. On a lovely Spring evening just after 8pm a bearded dragon has been found. Now at the GSPCA although a little thin the reptile has been named ‘Debbie’ and is safe, warm with some fresh food and water in a vivarium. The GSPCA are appealing to anyone that has lost their bearded dragon to please call the Shelter on 257261 or to pop in to the GSPCA in St Andrews. This morning we reported a stray canary that had been seen as a stray in the snow. The stray canary had been seen this morning in a garden near Princess Royal Centre at Les Ozouet. Only an hour ago the brird flew into a home near Melodonia on Route de la Houge de Pommier,. Geoff George GSPCA Animal Collection Officer braved the snow and caught the bird which is now at the GSPCA and we are delighted to report we have found the owner who is on her way. Helen Holmes GSPCA Admin Manager said "I've just taken the call and the owner is on her way." We have just had a report of a stray canary being seen this morning in a garden near Princess Royal Centre at Les Ozouet. It will likely be cold and weak so please watch out for this poor little bird that is unlikely to survive long in the current weather. Last night the GSPCA warden on call collected a stray cat from St Peter Port and the GSPCA are currently appealing for an owner to come forward. The female, tortie, long haired, adult cat is currently at the GSPCA, fit and well. Sadly she has no microchip or tag and if anyone has any information please call the Shelter on 257261. Steve Byrne GSPCA Manager said "Last night GSPCA Warden Michelle Champion was called out to collect a stray cat that has been around the Capston Walk area in St Peter Port." On the 28th April a stray Muscovy Duck was found on La Monnaie and the GSPCA are currently appealing for an owner to come forward. Now named 'Quackers' the bird is currently at the GSPCA, fit and well. The adult bird has been at the GSPCA for nearly two weeks and if anyone has lost their Muscovy Duck or has any information please call the Shelter on 257261. Yvonne Chauvel Senior Animal Care Assistant said "Quackers is doing very well but we would love to find the owner." Currently a very shy dog is loose around the Ladies Bay area. Molly a 7 year old black and tan cross breed went missing when out on a walk Tuesday morning. The owners have been out day and night in search of Molly and have asked us to share her details in case you see her. Molly has recently had a groom and trim and is wearing a red collar with cream paw prints with a tag with the owners details. 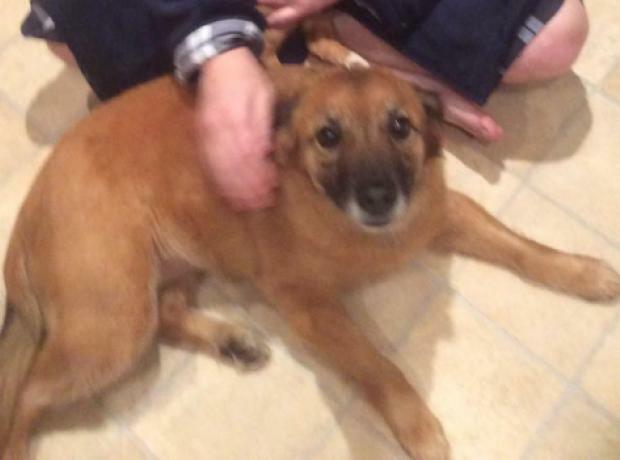 Molly is a rescue dog and very shy so unlikely to approach strangers.